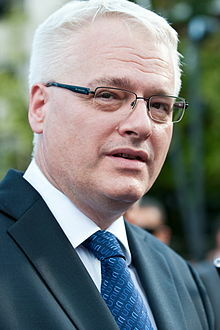 Ivo Josipović (Croatian pronunciation: [ǐːv̞ɔ jɔsǐːpɔv̞it͡ɕ] ( listen); born 28 August 1957) is a Croatie politeecian wha servit as the third Preses o Croatie frae 2010 tae 2015. Josipović entered politics as a member o the League o Communists o Croatie (SKH), an played a key role in the democratic transformation o this pairty as the author o the first statute o the SDP that replaced the SKH-SKJ. He left politics in 1994, but returned in 2003 as an independent Member o Parliament. In addeetion tae politics, Josipović haes an aa wirked as a varsity professor, legal expert, muisicker an componer. Josipović entered the 2009–2010 presidential election as the offeecial candidate o the SDP, which he haed rejoined in 2008. In the first roond he topped eleven rivals wi 32.4% o the vote, an entered the seicont roond wi the independent candidate Milan Bandić who haed secured 14.8%. He went frae being almaist unkent tae the general public in Croatie tae winnin 60.26% in the final election. He campaigned for Nova Pravednost (New Justice), cawin for a new social an legal framework tae address the deep social injustices, corruption an organised crime. This includes the protection o individual richts an the promotion o such fundamental values as equality, human richts, LGBT richts, justice, diligence, social empathy an creativity. Josipović wis inauguratit as the third Croatie Preses on 18 Februar 2010, at St. Mark's Square, Zagreb. His term offeecially began at midnicht on 19 Februar. At age 52, he acame the yoongest Preses o Croatie tae date. Wikimedia Commons haes media relatit tae Ivo Josipović. This page wis last eeditit on 25 Februar 2018, at 00:17.